This tour can be taken alone or combined with our Panama Canopy Tower & Canopy Lodge Tour scheduled for April 16 - 27. Stand eye-to-eye with Montezuma Oropendolas and Red-lored Parrots as they feed on fruit in branches just yards away from your perch atop a 5-story observation tower. Watch as Golden-collared Manakins perform on their lek just a short walk from your comfortable air-conditioned cabin. Observe several species of hummingbirds as they dip in and out of the water at their favorite bathing spot. Snorkel in a quiet lagoon as hundreds of jellyfish pulsate below you or cruise quietly along a canal teeming with birds and other wildlife. 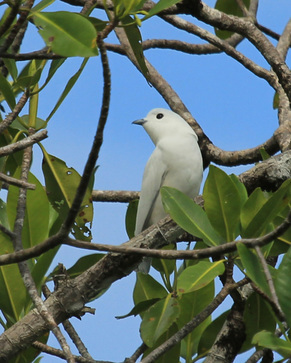 Visit "Bird Island" to see dozens of Red-billed Tropicbirds and Brown Boobies on their nests and tour a chocolate farm that shelters not just birds but poison dart frogs as well. Relax on the spacious deck of the main building or on your own covered porch and watch the resident birds in comfort. Go swimming on a pristine beach or snorkeling in unspoiled reefs. All of this, positioned in one of the loveliest spots in Panama, is Tranquilo Bay. Tranquilo Bay has listed over 180 species of birds onsite and over 400 from daily excursions to nearby bird-rich environments. It is an owner-operated eco adventure lodge located on Isla Bastimentos, Bocas del Toro, adjacent to Bastimentos National Marine Park. The property has over a kilometer of Caribbean coastline covered in coral gardens teaming with tropical fish. The facilities encompass over 40 hectares (100 acres), with over a kilometer of hiking trails full of wildlife, including a lek of very active Golden-collared Manakins. Why come to Tranquilo Bay? A better question would be, "Why not?" - Items of a personal nature, such as souvenirs, etc. TERMS AND CONDITIONS:Deposit of $600 with registration (link for registration form is at the bottom of this page). Balance is due on or before December 8, 2017.